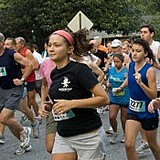 Join us for the Decatur-DeKalb YMCA 4-Miler and race through beautiful DecaturÂ neighborhoods. The moderately hilly course runs through wooded neighborhoods, offering shade from the heat. If you are interested in volunteering for the event, then please email Lisa Tanner. Registration for the Decatur-DeKalb YMCA 4-Miler will be available at the beginning of June.